scheduling is that it spares storage on your Multi-Media unit. so on. 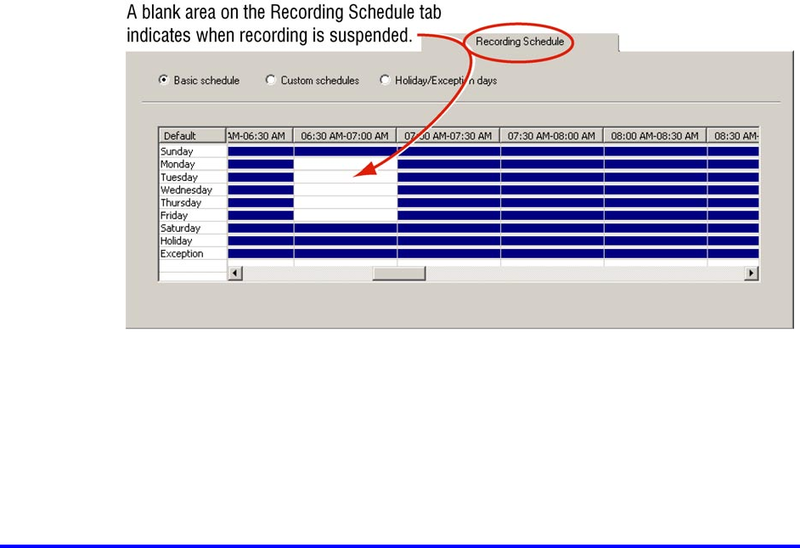 You can also customize schedules for specific cameras, or groups of cameras. Alarms can be scheduled as well; see 12.2 on p. 12–5. • “basic” schedule. The simplest way to assign cameras to the same schedule. See 12.1: Camera Schedule and 12.1.1: Holiday and Exception. • custom schedule. See 12.1.2: Customizing Schedules. many schedules. See 12.1.2: Customizing Schedules. 6:30 to 7:00, on Wednesdays. scheduled globally. See 12.2: Alarm Schedule.